PARIS — The world reacted with shock, horror and prayers to the massive fire Monday at the Notre Dame Cathedral in Paris, united in grief and in solidarity with the people of France. Spain’s prime minister offered France the help of his country in the recovery. French President Emmanuel Macron told reporters that he will seek international help, including the “greatest talents” in the world, to rebuild Notre Dame. The catastrophic fire engulfed the cathedral’s upper reaches Monday as it was undergoing renovations. Tourists and Parisians looked on aghast from the streets below. 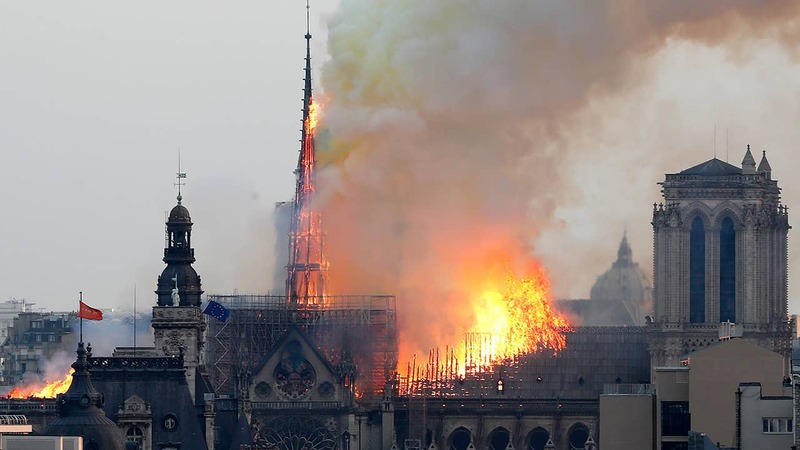 The exact cause of the blaze was not known, but French media quoted the Paris fire brigade as saying the fire is “potentially linked” to a 6 million-euro ($6.8 million) renovation project on the church’s spire. The exact cause of the blaze is not known, but French media quoted the Paris fire brigade as saying the fire is “potentially linked” to a 6 million-euro ($6.8 million) renovation project on the church’s spire and its 250 tons of lead. The Paris prosecutors’ office ruled out arson and possible terror-related motives, and said it was treating it as an accident. Flames shot out of the roof behind the nave. Hundreds of people lined up bridges around the island that houses the church, watching in shock as acrid smoke rose in plumes. Speaking alongside junior Interior minister Laurent Nunez late Monday, police chief Jean-Claude Gallet said “two thirds of the roofing has been ravaged.” Gallet said firefighters would keep working overnight to cool down the building.